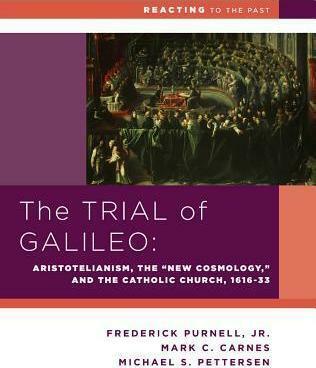 In The Trial of Galileo the new science, as brilliantly propounded by Galileo Galilei, collides with the elegant cosmology of Aristotle, Aquinas and medieval Scholasticism. The game is set in Rome in the early decades of the seventeenth century. Most of the debates occur within the Holy Office, the arm of the papacy that supervises the Roman Inquisition. At times action shifts to the palace of Prince Cesi, founder of the Society of the Lynx-Eyed, which promotes the new science, and to the lecture halls of the Jesuit Collegio Romano. Some students assume roles as faculty of the Collegio Romano and the secular University of Rome, the Sapienza. Others are Cardinals who seek to defend the faith from resurgent Protestantism, the imperial ambitions of the Spanish monarch, the schemes of the Medici in Florence, and the crisis of faith throughout Christendom. Some embrace the "new cosmology", some denounce it, and still others are undecided. The issues range from the nature of faith and the meaning of the Bible to the scientific principles and methods as advanced by Copernicus, Kepler, Tycho Brahe, Giordano Bruno, and Galileo. Central texts include Aristotle's On the Heavens and Posterior Analytics; Galileo's Starry Messenger (1610), Letter to Grand Duchess Christina (1615) and Dialogue on the Two Chief World Systems (1632); the declarations of the Council of Trent; and the Bible. Michael S. Petterson is Joseph A. Walker Professor and Chair of Physics at Washington and Jefferson College. He has published work in the area of surface physics. A strong proponent of general science education, he has taught a variety of courses for nonscience students, including environmental physics and astronomy. Frederick Purnell, Jr. was professor of philosophy at Queens College and the Graduate Center of the City University of New York. A specialist in Renaissance and early modern thought, he published numerous articles based on his research in European libraries and archives. His work emphasized the relationship between philosophy and science in the late sixteenth and seventeenth centuries, with particular attention to thinkers with ties to Galileo. The Galileo game is dedicated to the memory of Professor Purnell, a fine scholar, committed teacher, and unabashed lover of Rome. Mark C. Carnes is professor of history at Barnard College and creator of Reacting to the Past. He is the author of many books in American history and general editor of the 26-volume American National Biography, published by the ACLS and Oxford University Press.